Everyone loves sweets in one form or another. Unfortunately, sucrose (“table sugar”) is fattening, promotes tooth decay, increases your blood glucose levels (Glycemic Index) and triggers the insulin reaction. For decades, dieters, diabetics and people concerned about their dental health have sought an alternative to sucrose. Although the perfect solution has not yet been discovered, there are many choices. The majority of sugar substitutes approved for food use are artificially synthesized compounds. However, some natural sugar substitutes are known, including sorbitol and xylitol, which are found in berries, fruit, vegetables and mushrooms. The three primary compounds used as sugar substitutes in the United States are saccharin, aspartame and sucralose. In many other countries cyclamate and the herbal sweetener stevia are used extensively. SACCHARIN (Sweet’N Low) was discovered in 1879 by a scientist with abysmally poor lab technique. He spilled a chemical onto his hand and later touched it to his mouth. Saccharin got a bad reputation in the 1970′s when experiments with rats indicated it might be carcinogenic. Although the FDA attempted to ban saccharin in 1977, Congress issued a moratorium overriding the ban. The moratorium was extended seven times until 1991, when the FDA formally withdrew its proposal. CYCLAMATE (Sucaryl) was discovered in 1937 in a similar manner. A grad student who set his cigarette on a lab bench tasted sweetness when he took another drag. Cyclamate widely used both as a table-top sweetener and in foods until it was banned in the US in 1970, but is still in use in other countries. In 1984 the FDA concluded that cyclamate was not carcinogenic, and reversed its decision in 2000. ASPARTAME was discovered in 1965 by a scientist who licked his finger to grab a sheet a paper. Aspartame (NutraSweet and Equal) quickly replaced saccharin in many foods. Unfortunately, aspartame breaks down at elevated temperatures (it can’t be used in cooking), in carbonated beverages and simply over time. Because it is compounded of two amino acids, aspartic acid and phenylalanine (and breaks down into those compounds in the body), persons with the rare inherited disease Phenylketonuria should avoid aspartame. Persons suffering from fibromyalgia may also want to avoid foods containing aspartame and MSG. In addition, there have been reports of possible medical problems associated with aspartame. It has only 4 calories/gram, identical to sugar, but is 200 times its sweetness. SUCRALOSE is the only non-caloric sweetener actually made from “real” sugar (sucrose). Discovered in 1976 when a student tasted instead of tested, it was granted approval by the FDA in 1998 and appears in little yellow packets on restaurant tables under the brand name “Splenda.” Although sucralose is made from sucrose, it is not broken down by the body like sucrose and not used for energy. Research demonstrates that sucralose has no effect on carbohydrate metabolism, blood glucose control or insulin secretion. TAGATOSE (Nutrilatose) is a naturally occurring sugar that can be found in small quantities in some dairy products. Its use as a low-calorie sweetener was determined in 1981. In the late 1980s Spherix patented an inexpensive process to produce tagatose in bulk from whey, a byproduct of cheese-making. Tagatose has only 40% of the calories of sucrose and is incompletely absorbed during the digestive process, providing the same bulk as sucrose with significantly fewer calories. The FDA has affirmed that tagatose may be used in food products “generally recognized as safe. 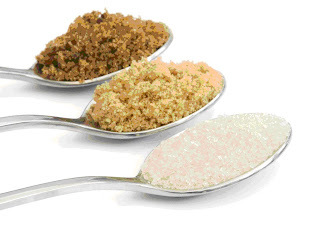 The polyols MALITOL, MANNITOL, SORBITOL, XYLITOL and others are naturally occurring sugar-free sweeteners. Although called “sugar alcohols”, they are actually carbohydrates. Polyols can be used volume-for-volume like sugar, tend to have a low GI and cause smaller increases in blood glucose and insulin levels than do sugars and other carbohydrates. The FDA classifies some polyols as generally safe, and others are approved as food additives. Research has shown that regularly chewing xylitol sweetened gum actually reduces the incidence of dental decay. It is an ideal sweetener for gum, toothpaste and candies but can cause stomach upset and diarrhea in excess use.